Children are taught to respect the symbols of America from their first day of school. 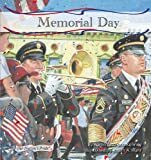 Memorial Day provides teachers an easy-to-read picture book explaining the creation, history, and meaning of the holiday that honors our nation's soldiers. Looking Glass Library is an imprint of Magic Wagon, a division of ABDO Publishing Group. Grades preK-4. Juvenile Nonfiction > History > Symbols, Monuments, National Parks, etc.